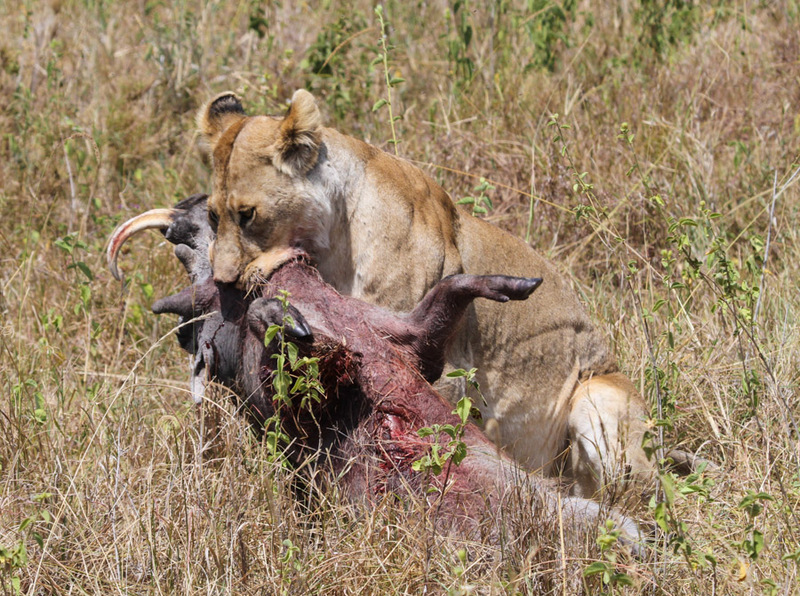 So, our last post ended in the early afternoon of Day 4 of our 5-day Serengeti stint with this lioness carrying off a warthog she had just killed. Up to that point, we had seen lots of cats, but we just didn’t have any encounters that produced the great photos we hoped for. It seemed that our South African-induced “Curse of the Cat” was going to haunt us for our entire time in Tanzania, too. But, just as we were headed back to camp that day, we witnessed the scene above, and suddenly things changed. It was if some offstage director in charge of the comings and goings of wildlife in the Serengeti yelled: “Cue the cats!” That’s right, our luck had finally changed. For our last 24 hours in the Serengeti, we saw cats everywhere. Just after heading out again that afternoon, we ran into this large male and three lionesses hunting a small herd of gazelles. 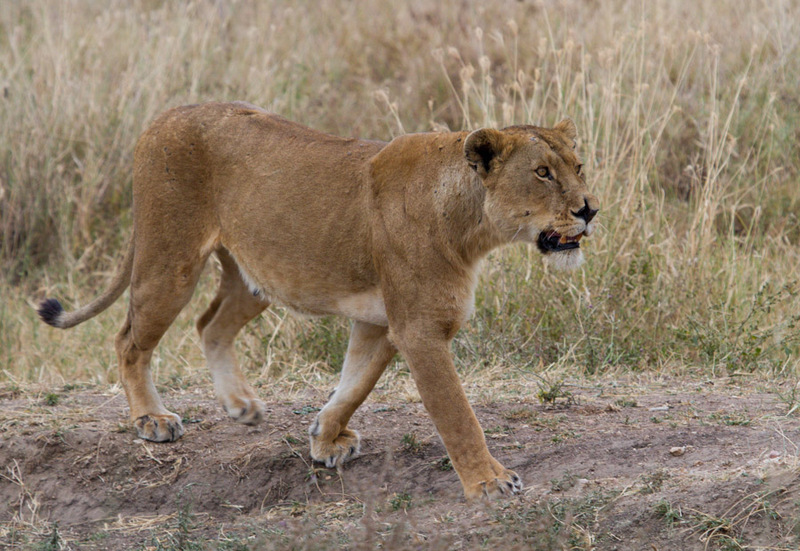 Later on, we encountered one of the same lionesses roaming on her own. It was easy for us to recognize her with such a distinguished battle wound on her nose. 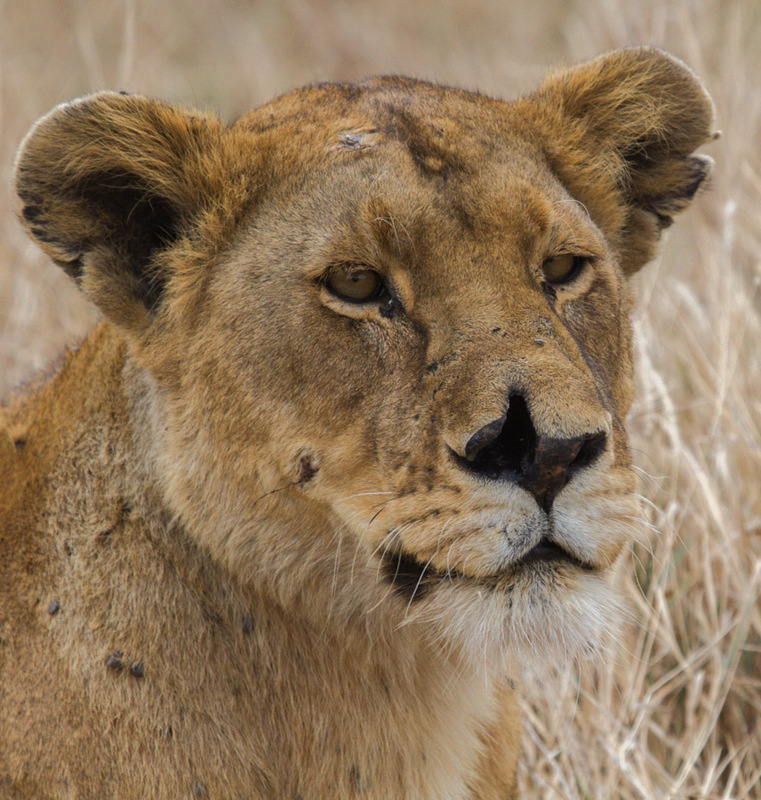 We wondered what animal might have caused such a scar—a true reminder that it’s not always easy being queen. Just before sunset, we came across another pride of lions, sleeping in the grass. For the most part, the group of 10-14 lionesses and juvenile cubs were spread out and laying low, so it was hard for us to get an accurate count of just how many there were. 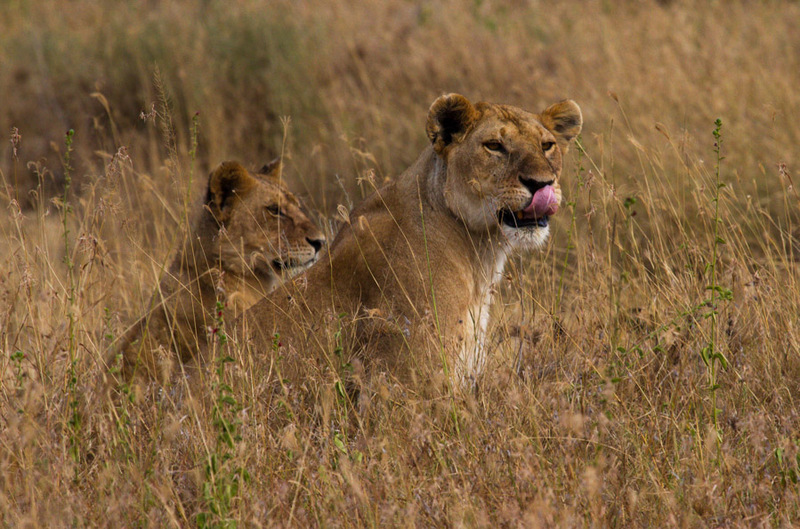 A pair of lions suddenly poked their heads up, alerting us to a lioness approaching. 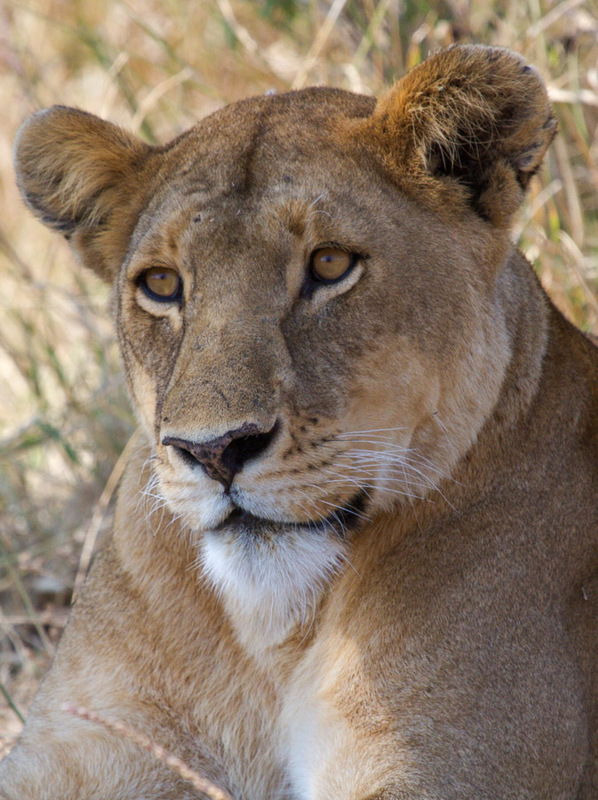 Their keen interest in her return made us wonder about the solo lioness and her status in the pride. There was a small pond 50 meters or so from where the pride was sleeping. A reedbuck wandered up for a drink of water and caught wind of the lions. He repeatedly let out loud danger calls, but the lions seemed indifferent to his warnings. This stand-off continued for several minutes, when, suddenly, every single one of the lions jumped to attention. They had their backs to us, but just imagine how that reedbuck must have felt when he saw a dozen or so lions staring him down. Lucky for him, the lions decided he wasn’t worth the effort and laid back down to continue their siesta. On our drive out of the park the next morning, we found another leopard in a yellow fever tree. This one was hanging out high in the canopy at least 30 meters in the air, and he seemed somewhat bothered by our presence. On closer inspection, we understood why. He had a fresh kill stashed up in the tree, and these elusive cats prefer dining alone. The leopard must have had his fill for the time being—just look at that belly! Geez, Louise! That gives whole new meaning to the notion of sweet nothings being whispered in your ear, doesn’t it? That belly doesn’t look so full as it does pregnant! Well, that’s what happens when you gorge on gazelle–you look pregnant! Wow! These pictures are amazing! I can’t believe you even managed to get footage of them mating. What an experience! Thank you! You can tell by the audio in the clip that we were really excited. We have spent a lot of time on safari, but it was the first time we had ever seen something like that. We felt super lucky! I saw two gorillas do that at the zoo this summer. Before they did the deed, the female threw her hands up and backed away as much as she could. It was hysterical! Well, that’s a pretty eventful trip to the zoo. How funny! Thanks, Jenn! You have to put Africa on your travel list. You would absolutely love seeing all those animals and birds in person. Great photos – inspires me to look forward to my trip to Namibia in September 2014. You will have a wonderful time in Namibia. We were there in 2010 (in our pre-blogging days) and absolutely loved it. Thanks for stopping by!